Spider-Man: Homecoming is finally in theaters and those who have seen it largely agree that it is the best Spider-Man movie in more than a decade. Possibly ever. That's up for debate but, the point is, this is a great adaptation. 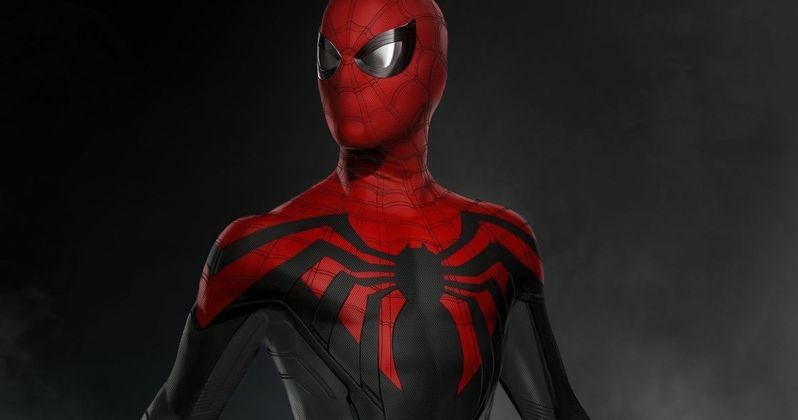 It is very faithful to many aspects of the character from the comics, not the least of which is the costume design, which finally features the classic Steve Ditko web-wings. But there were some alternate costume designs that didn't make it into the movie, one of which that has been revealed by artist Ryan Meinerding. The costume in question was posted by Ryan Meinerding on Twitter recently and, even though it didn't make it into Spider-Man: Homecoming, it is pretty great. This is another one ripped pretty faithfully from the world of Marvel Comics, but a different series of comics. According to Meinerding, this one was inspired by the Superior Spider-Man run by the great Dan Slott and Ryan Stegman. The costume keeps the classic Spidey look, but trades in the blue for black and looks a bit more mean. Something about that black and red combo. Here's what Ryan Meinerding had to say about it. "I did a lot of designs for the new #SpiderManHomecoming suit. Here's an unused one based on #superiorspiderman by @DanSlott and @RyanStegman"
There are probably a few reasons why the costume didn't make it into Spider-Man: Homecoming, none of which likely have anything to do with the quality. Because, as you can see, it's a pretty great design. They ultimately decided to go with a more classic look for most of the movie. Plus, The Superior Spider-Man is kind of an odd run to pull from for this movie. If you aren't familiar, that particular series sees a revived Otto Octavius, aka Doctor Octopus or "Doc Ock," taking over Peter Parker's body *spoilers* following his death and assuming the mantle of Spider-Man. So it wouldn't necessarily make much sense to have Tom Holland's Peter Parker galavanting around New York City in that costume. But he probably would have looked great doing it. Whatever decisions were ultimately made by Marvel and Sony worked out just fine, costumes or otherwise. Spider-Man: Homecoming has been a massive hit with fans and critics alike, currently boasting a 93 percent approval rating on Rotten Tomatoes. The movie has also been a monster hit at the box office. As of this writing, Spidey's latest big screen adventure has raked in a very impressive $472.8 million at the box office. This is poised to become Marvel's biggest hit of the year. It also has a decent shot at becoming the highest-grossing superhero movie of 2017. But Justice League may have something to say about that come November. There are going to be plenty of opportunities for different Spider-Man costumes to make their way into the MCU in the future. We already know we are going to see his new Avengers costume, courtesy of Tony Stark, in Avengers: Infinity War next year. Plus, Spider-Man: Homecoming 2 is due out in 2019, which will probably see another new costume or two as well. Be sure to check out Ryan Meinerding's alternate Superior Spider-Man costume for yourself below.